Flute Visions, the center-point is music. 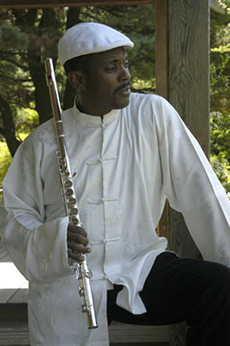 Flute Visions is a musical ministry with a universal concept in which the center-point is music. The purpose of the ministry is to nurture the hearts and souls of the listening audience and to educate on the importance of clean air and water in respect to 'Mother Earth'. Every one of us is a flute waiting for Life's precious gift of clean air to fill our lungs, to feed our brain cells, give us life in abundance and keep our hearts pumping with the flow of blood through our bodies. Using music and nature-cinematography, Flutev Visions is designed to awaken the listener by creating an atmosphere that will allow the audience to visualize the importance of ones connection to every living creature on the planet. I want to share my vision and bring the listener closer to the idea and importance of saving the planet. I have learned throughout my life that music can vibrate the unseen core of the human soul. I believe in the arts, all of them. Flutevisions is an art form that will piece together the lost art of love for oneself and bring about the human sympathy for mankind and the planet. Remember - the planet has a life of its own. If you take care of it, it will take care of you.